Claude Arpi: A problem left over from history! Now, it is clear, the Daulat Beg Oldi (DBO) episode was entirely due to the 'hysteria' of the Indian press. It is at least what The Global Times, the English-language mouthpiece of the Communist Party would like us to believe. I like this sentence: "Some Indian officials caution that China should pay no heed to the radical voices among some Indian media which sensationalize news. But their malicious impact is so real that it cannot be ignored." Does it means that the Chinese intrusions should have been ignored by the media? Yes, says Beijing, because according to the new leadership, there was no intrusion, the PLA just came for a 'camping' excursion on their own piece of land. Interestingly, for the first time, the website of The PLA Daily of the People's Liberation Army mentions the 'incident'. Till yesterday, it was as if nothing had happened. The military site quotes Xinhua and the Foreign Ministry spokeswoman: "China and India have engaged in close contact and consultation with aims to properly handle problems along their border." The communique adds: "In response to Indian media reports of a 'stand-off' along a western part of the China-India borderline, the two sides are communicating with each other closely through a consultation and coordination mechanism on border issues. Through this contact, both sides have learned more about each other's concerns and stance, helping to find an appropriate solution to the problems." It means that Beijing 'had' to communicate 'in response to the media reports'. And of course, "The border issues are a problem left over from history". It is an absolutely correct statement, before China invaded Tibet in 1950, there was no border issue between India and Tibet. The spokesperson sounded optimistic: "We believe that China and India are wise and capable enough to handle the existing differences and problems while boosting friendly cooperation between the two countries. ...What is important is that the two sides should resolve the problems by friendly consultation through the mechanisms and related channels." It looks like Beijing wants now to find a way out of the 'dispute'. It will, of course, be on their own terms; Delhi has no choice in this matter. 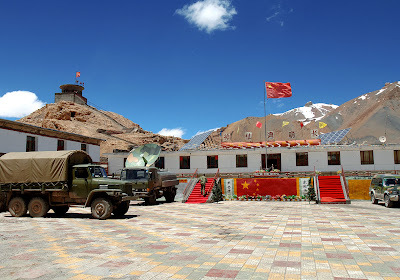 Indian media and opposition politicians have been reporting that Chinese soldiers intruded on Indian-claimed territory and erected tents inside Indian borders. Such reports run along the same lines as those in 2009 that alleged Chinese soldiers had entered into India and painted the rocks with red spray paint. Indian officials denied suchreports eventually, though the case remains unsolved. A report in the Times of India claimed that many Weibo users are demanding the Chinese government "teach India a lesson." It further said that tacit official encouragement was behind such Internet postings, as the government would "block any campaign against what they regard as 'friendly countries.'" The Times of India is India's largest English newspaper in terms of circulation. Its nonsense will influence mainstream society. Some Indian officials caution that China should pay no heed to the radical voices among some Indian media which sensationalize news. But their malicious impact is so real that it cannot be ignored. The Indian public has been informed about Chinese troops' "intrusion," while provocative words uttered by Indian media and politicians can be read by Chinese people online. However, the reality is that communication over border issues between China and India has usually been smooth. Officials from both sides speak highly about the peaceful state of border areas. There have been discrepancies between the two concerning the exact position of the Line of Actual Control. Troops from both sides patrol around their claimed border lines, but both try to avoid causing any real frictions. The Indian government ought to clarify the so-called "intrusion" in a timely way and assume the responsibility of maintaining a good atmosphere. However, it hasn't done so. It has remained silent and ambiguous, which indulges Indian media habits. Indian media have continuously created trouble for the Sino-Indian relationship. India seems to be in the driving seat of the bilateral relationship. Indian policy toward China can be fickle, while China's levers for balancing the relationship are much simpler and scarcer. Therefore, Indian media and opposition should be balanced, so as to prevent them from enjoying privileges outside intergovernmental communications and negotiations. Either the Indian government should stand up to report true information to Indian society, or it should let Chinese public opinion contend with India's. Staking claims to its borders is of crucial significance to China and peace and stability along the border are also vital to India. Current peace and status quo is not bestowed by India alone. China should firmly maintain its friendly policy toward India. However, this doesn't mean that China will ignore provocations. Otherwise, the unhealthy tendency of hyping up China will keep happening.